A paper sign-in sheet just isn’t enough to handle the volume of students and it’s hard to justify a person dedicated to greeting people upon arrival. 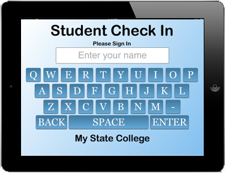 Our Check In System will alleviate the line and push the student information to each desktop. Your staff now has the organized student queue on their desktop, allowing them to respond faster and reduce the wait time. With the latest touch screen tablets comes a new generation of devices that are being put to the simple tasks of our offices. They are inexpensive, low maintenance and easy to replace. Apple iPads are less than one tenth the cost to own compared to PC style touch screens. We use these latest devices to build an easy to use, patient kiosk. 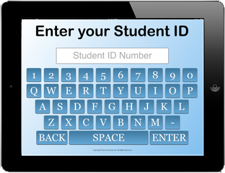 With a Student Kiosk your data is stored in a reusable database. Using a name, a reason and three simple date and time stamps, we can create reports to help analyze and manage your office efficiency. The data shows volumes by date and time, wait times for each person and reason, and allows you to evaluate office and staff performance. Staff can look up the last person to help the student and when. This would allow follow up visits to flow better. 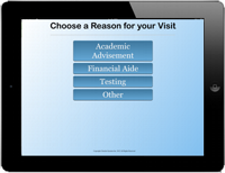 You can also lookup how many times a particular student has visited.